Have you ever wondered why Degas loved painting dancers? Was he was captivated by the graceful movements ballerinas so perfectly execute? Did the excellence of their craft birthed from years of dedication to practice remind him of his own artistic journey? Thanks to historians and researchers, the answers to these questions are becoming demystified. Known as “the painter of dancing girls,” Edgar Degas helped establish Impressionism. However, he preferred to be recognized as a realist painter. Early in his career Degas wanted to be a history painter, but in his thirties he became primarily a classical painter of modern life. At 39 years old, just a few years after his transition out of history painting, he began painting, sculpting and sketching dancers. 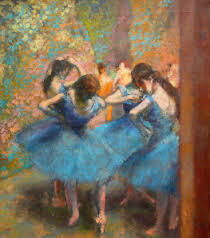 Over half the works of Edgar Degas are inspired by ballet. It may have been Degas’ love for modern realism and classical beauty that initially drew him to ballet as a major form of artistic inspiration. However, his affinity for and engrossment with ballet itself was what anchored his interest in the subject for the rest of his career. John Richardson, writer for Vanity Fair, commented that at the time Degas’ obsession with ballet began, “The golden age of Romantic ballet was long since over…French ballet could hardly be considered an art form.” In some ways, ballet was despised in Degas’ time. 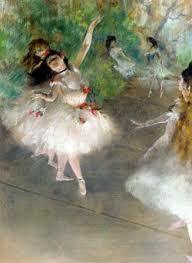 Despite this (or perhaps because of this), Degas made ballerinas the central theme of his artwork. Although he did not depict ballet as glamorous (on the contrary, his artwork revealed the harsh realities of the grueling life of a dancer), his choosing of the ballerina as his primary source of inspiration did bring some type of honor to the then-underestimated art form. It’s a good thing Degas took a notion to devote much of his life to painting ballerinas; his pictures of dancers were, are and will likely remain wildly popular. Obviously, the French painter pulled some heartstrings with his paintings, sculptures, prints, pastels, and pencil and chalk drawings of ballet-inspired subject matter. 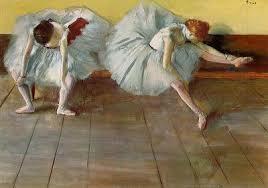 Perhaps there is something in Degas’ dancers that we recognize in ourselves. This entry was posted in ballet, Dance, Dancers, Degas, Edgar Degas, Impressionism, realism and tagged Art, artistic, ballerina, ballerinas, dancer, dancers, Degas, edgar, edgar degad, impressionist, loved, modern realism, painting, subject on May 20, 2015 by segmation.